The LA Unified school board faced a difficult decision in June. It had previously voted to raise the bar on its graduation requirements starting in 2016 in an effort to get more students into college, but it was clear not enough students were ready for the challenge and graduation rates would plummet if aggressive action was not taken. The board ultimately chose to stick with the raised bar, and the district is now entering the final stages of that difficult decision. More than 6,000 seniors are currently failing at least one of their required “A though G” courses, meaning if they can’t raise their grade to a D by the end of the semester in six weeks, they will not graduate on time. Yet these students are considered “on track” by the district because to be labeled on track, a student need only be enrolled in the required A-G courses. And 10,000 more are considered “off track,” meaning they are missing one or more A-G class. “While I am encouraged by the recent efforts and commitment (to A-G), it also shows us the gap of the work that we have today,” board member Monica Garcia told LA School Report. 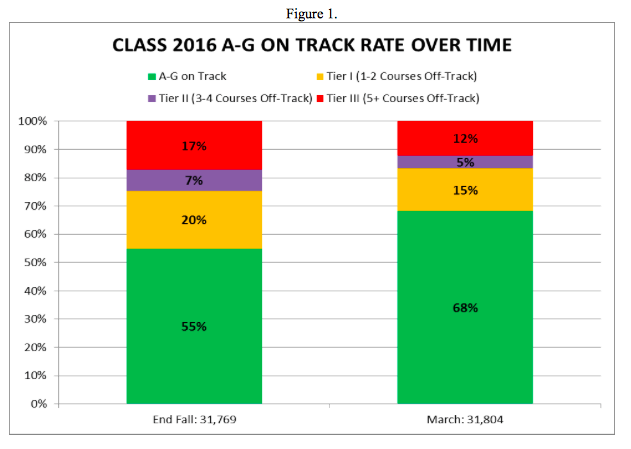 A recent district report showed that 68 percent of seniors are currently “on track” to meet their A-G course requirements — a number that has been predicted to significantly rise before the semester is over — but 30 percent, or 6,400, of those on-track students were failing a course at the 10-week mark. While district leaders have expressed optimism that many students are getting the help they need, it is clear that a significant number of students who last year would have otherwise graduated with the same final transcript will not do so this year. Thousands of other students will also graduate having earned D’s in the A-G courses, which means they will not be eligible for California’s public universities because C’s are required. And still thousands more will graduate only due to a massive $15 million credit recovery program that allows them to earn a C if they can demonstrate proficiency in an online course, a practice that has been called into question by some education experts who characterize it as an essentially cheap and faulty way of getting a student to graduate. The results at San Diego Unified are bittersweet, with more students than ever meeting the A-G requirements, while at the same time graduation rates are set to drop from 87.5 percent in 2014 to 72 percent this year. Ten percent more San Diego students may become eligible to apply to the California public university systems, but 16 percent more may fail to graduate. “In sum, by increasing graduation requirements, San Diego and other districts have opened more doors to success. Ironically, they have also opened more doors to failure, in the sense that a greater number of students are now at risk of not graduating,” the report stated. While district leaders are predicting that LA Unified will avoid any graduation crisis due to the credit recovery program, and that graduation rates may even rise to new highs, the district still grapples with the same issues San Diego is facing from choosing to raise the graduation bar. Like San Diego, LA Unified lowered the planned requirement for C’s to be earned in A-G classes for graduation to D’s, even though it meant the ultimate purpose of getting kids into college would not be met. According to a district memo, as of March, 48 percent of LA Unified seniors were on-track to graduate with C’s or better in all A-G courses, meaning if the district actually meets the predicted rate of 80 percent graduation this year, some 11,000-plus students will be graduating without qualifying for admittance to California’s public universities, which is the entire intent and purpose of the A-G graduation standards. One promising statistic for A-G supporters is that overall the district’s A-G completion rate has gone from 18 percent in 2005 to the projected-and-rising 68 percent of today. * A previous version of this story said San Diego Unified was not undertaking a large credit recovery program. The report citied includes only data through August before the credit recovery program began.